The Director and Co-Founder of No1 Draft Pick, Danny Kordahi, is one of Australia’s most respected entrepreneurs. Starting out with not much more than an old laptop computer – and a healthy dose of ambition and drive – Danny created his own highly successful promotional and corporate clothing company. 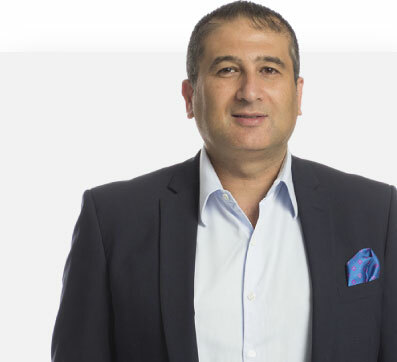 Eventually he joined forces with his brother to form DKM Blue, an entity which has become a powerhouse in the world of marketing and merchandising with offices in Sydney, London and Shanghai and a global portfolio that includes clients such as Microsoft, Mercedes Benz, John Deere and Samsung. He is also a past president of the Sydney Chapter of EO (Entrepreneurs Organisation) and a Small Business Ambassador for American Express. But as successful as he has been in business, outside his family his first and greatest love is the sport of basketball. From an early age he was a standout, particularly as an outside shooter. He was blessed with great intelligence and a fierce work ethic that allowed him to have great success as a junior. A star in high school, Danny made the NSW Combined Catholic Colleges team while attending De La Salle College in Ashfield, and also travelled to the USA, Canada, Philippines and Lebanon to play basketball. He began his representative career at the age of 15 with the Western Suburbs Magpies before heading to the Parramatta Wildcats and later had a stint with the Illawarra Hawks Youth League team. He also played for the St. George Saints and the Hornsby Spiders in the NSW State League competition before unfortunately being forced to retire from the sport due to a back injury. But his love for the game and all its possibilities has never diminished. In recent years, Danny has been involved heavily at a local level with his beloved Sydney Kings and his marketing expertise combined with his extreme passion for the sport has seen him engage with the National Basketball League in a number of key initiatives. His creation of No1 Draft Pick showed a man who clearly has enormous love for the game and is determined to give back to those young boys and girls who are starting their journey in basketball, in much the same way he did so many years ago. He believes that through the No1 Draft Pick Basketball Academy, they will win whether they pursue basketball or business as a career. Danny is all about building the game and helping kids achieve their goals in the sport, no matter how large or small. Danny has one ultimate goal in mind – to use No1 Draft Pick to give players the opportunity to follow their passion and attend College in the U.S. on a basketball scholarship, and hopefully in the future become an NBA or WNBA No1 Draft Pick. It’s a great goal. An achievable goal. But in the end, it’s all about making a difference in the lives of young people. That’s what No1 Draft Pick is all about.